41 years ago today, men from the planet Earth set foot on the surface of the moon, stating "That's one small step for a man, one giant leap for mankind." Truly the greatest accomplishment of mankind. Today, the president is determined to kill the dream and end American manned space exploration; scrapping the space shuttles and the Constellation rockets which would take us to the Moon, Mars and beyond. The Bear Stearns bailout cost about $30 billion. A year in Iraq and Afghanistan costs about $130 billion. Let's show where our priorities should be; let's launch a bright, exciting future for all Americans--and rebuild our economy as a result! 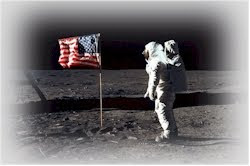 Let's put NASA back on track and make all Americans proud!